A lot of speculation has been directed towards the GOP and Democratic contenders for the number one seat in the land. But what about their household pets (or lack thereof) that may or may not be taking up residency alongside them? Do you judge a presidential candidate differently based on whether or not he or she is a pet-owner? Well, to assist you with that thought process, I have researched the current status of each presidential candidate, and in so doing have taken the liberty to provide you with my political assessment and potential campaign slogans for each. Take a moment to consider each one closely, to determine if you think there should or should not be a First Pet in the White House in 2017? 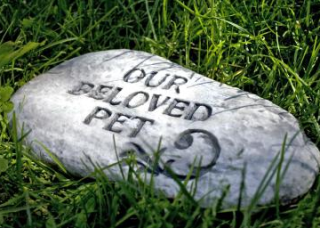 For those who remember the Clinton’s pets in the back in the nineties when they occupied the White House — both their chocolate Labrador Retriever Buddy and Socks the cat are no longer with us. The former was killed in an unfortunate car accident and the latter was given to Betty Curie, Bill’s former personal secretary during his tenure as president. 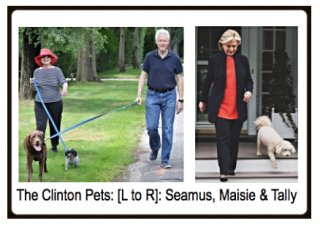 Today the Clintons are proud owners of three dogs — and should Hillary become our next president, she will most likely bring their 11-year old arthritic Seamus who is Buddy’s great-nephew, Tally, a toy poodle and Maisie, a curly-haired pup of undetermined breed. POLITICAL ASSESSMENT: Three for the price of one! According to online sources and his Facebook page, it does not appear tht Bernie Sanders owns a pet presently. 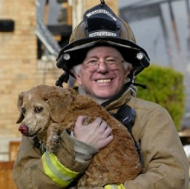 However in a recent article titled, “Bernie Sanders Saves Dog From Burning Building. . ." a satirical report posted by the ‘fakenews’ site TheGoodLordAbove.com does relate a whopper of tale that had Bernie saving a dog from a burning fire. Taking the opportunity to poke fun at mainstream media for not picking up the story, the intent of the post was done in jest to point out that even if Sanders were to commit a truly heroic act, the press would not find it newsworthy enough to print it. POLITICAL ASSESSMENT: If Bernie enters the White House pet-less — there will no pet hair to clean up! 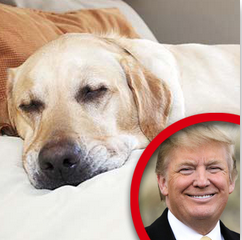 No one is quite sure why Donald Trump named his yellow Labrador retriever “Spinee,” except that it perhaps differentiates her from Trump's opponents who he would be first to insult: "lack a spine." That aside, Spinee was recently in the news after undergoing a recent risky surgery at the Washington Veterinary Hospital on February 15, 2016 prompting the billionaire to ask his prospective voters to send well wishes her way. Then throughout the night he posted subsequent updates about her condition indicating while “she is not out of the woods. . . prayers (are) working." POLITICAL ASSESSMENT: Spinee might provide the billionaire with the sympathy vote! POLITICAL ASSESSMENT: Snowflake might need to control his urinary tract, less he undue all the hard work Michelle Obama put into the White Lawn's vegetable garden. CAMPAIGN SLOGAN: "Snowflake promises you Pees & Prosperity! " 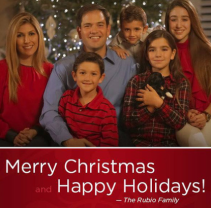 Florida Sen. Marco Rubio and his wife Jeanette requested their daughter Daniella sign a pet care contract before bringing home a Shih Tzu puppy, reported Parade in September 2013. They named the puppy “Manna,” inspired by the phrase “manna from heaven,” which refers to the miracle when God bestowed bread to the Israelites in the Exodus. Two months later, the tiny canine puppy appeared with the family on their annual Christmas Card. POLITICAL ASSESSMENT: Since Manna is Chinese, might this mean new trade agreements with China? According to Mother Jones’ news correspondent Stephanie Mencimer, “when it comes to naming new family members, the Bush dynasty isn’t particularly creative (since) there are three Georges, two Barbaras and a couple of Prescotts in the family." And this tradition applies to their pets as well. 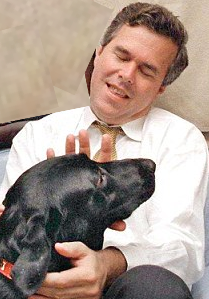 When Jeb Bush was given a black Labrador a year prior to winning his Florida seat for governor, he opted to call the dog “Marvin” after his least-famous brother. Guess he thought his brother needed the extra ego boost. Unfortunately Marvin passed away in 2006 at the age of 11, just two days before Bush signed into law “doggie dining” legislation, allowing canines to enter Floridian restaurants. Nonetheless, it does appear that this particular canine was the inspiration for Jeb pushing through the new law. POLITICAL ASSESSMENT: Like Bernie Sanders, a pet-less president collects no fur. At the New Hampshire home of Republican supporter Linda Kaiser — who was the hostess of a campaign fundraiser for the Governor — she accidentally ran over her dog “Magic” in her very own driveway. When Kasich learned of the unfortunate news, he not only cut the event short, he changed his schedule for the remainder of the day indicating that he wasn't going to doing anything political until he personally buried the dog. POLITICAL ASSESSMENT: While he won't be bringing a pup to the White House, he does have a soft spot for them! While there's no visual evidence found online in 2016, Time magazine ran a story on Ben Carson back in September, 2015 indicating that while Carson did not own any pets, his campaign staffers were very successful in positioning him as a pet lover. 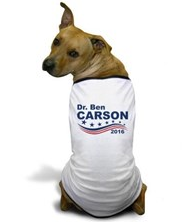 It noted that “Ben Carson’s Facebook page was filled with photos of various types of pets. One pictured a dog reclining by a sign that states: “Brownie Barks for Ben" and Grasshopper the Rabbit is positioned by a homemade “Bunnies for Ben” poster. And in another, Lucky and Lulu the hamsters sniff around a “Run Ben Run” sign, as they circle their cage in search of nourishment. 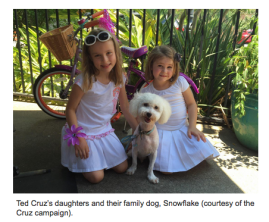 Pictures of these four-legged supporters were uploaded extensively, after Carson's campaign team created a “Pet Week” on all of his social media accounts. This resulted in the press complimenting the doctor for having one of the most-trafficked and engaged political pages of any candidate, back in mid-2015. POLITICAL ASSESSMENT: If Mr. Carson is truly a bonafide pet-lover, he might want to consider adopting one or more before he steps into the White House. So there you have it. 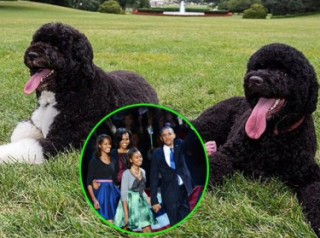 While not all candidates are accompanied by man's best friend (nor even a cat or bird), they will be moving into a residence that was once the domicile of Bo and Sunny, the Obamas’ Portuguese Water Dogs. And if it's true what they say about dogs marking their territory, it could get a wee bit dicey for the next inhabitants. Yes. 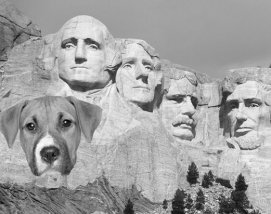 . . for the next POTUS to arrive with or without pooch(es) in tow, they might want to consider doing a thorough clean sweep of the premises, so they and their furry friends do not have to deal head-on with the pungent aromas left by the previous tenants. So there it is readers. Now, are you for or against a PPOTUS in the White House — and if so, will that turn the tides for you as to which candidate you vote for? Or are you still undecided . . . giving it paws, sort of speak? What's In Those 50 Calorie Dog Treats?